The purpose of this spirituality newsletter for priests is to offer yet another aid to priests in the development of their spiritual lives. We live in very critical times for both the Church and the world. We priests, by our very vocation, are in a most advantageous position to make an extremely significant contribution to the betterment of both Church and world. And the more we ourselves grow spiritually according to the Gospel message, the more we are able to help the Church and the world progress according to God�s will. 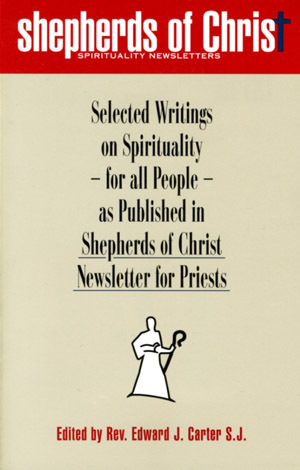 The subtitle of this book is Selected Writings on Spirituality�for All People�as Published in Shepherds of Christ Newsletter for Priests. Consequently, we offer the following pages to all. Although some entries are aimed specifically at priests, the overwhelming percentage of the material can hopefully be used by all those interested in growth in the spiritual life. May the ideas contained in this brief overview of the spiritual life be deepened and expanded through the reading of the following pages. Fr. Edward J. Carter, S.J.